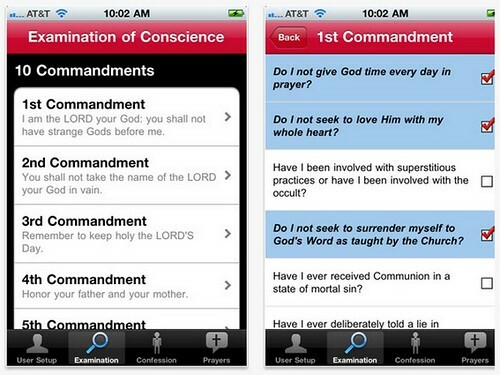 The Roman Catholic Church has approved an iPhone app called Confession. It's only $1.99 and it bills itself as "the perfect aid for every penitent." to me, a desperate looking attempt by the Vatican to stay relevant. kinda reminds me of those "rock" bands you see playing on the Christian channel CTS - the dudes have torn jeans and the set looks like an alley. Ryan and Gump don't you have anything useful and relevant to say?! Anyway, sounds like a handy tool, but a pamphlet is just fine for us lower tech people! Examination of conscience is not an easy task, the mind takes you wandering and wondering if you don't stay focused. A guide is often helpful. A confession app is not really a sacrament because you need to do this personally so you may be blessed by the priest himself.